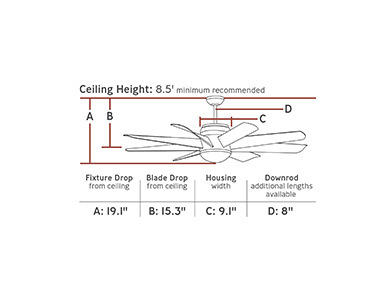 Making a bold statement with eight curved, sloped blades, the 56” Turbine LED ceiling fan has an ultra-modern aesthetic. The DC motor provides powerful airflow and outstanding energy efficiency. Cool features include the integrated 10W LED uplight and 20W downlight, both with sleek, Matte Opal glass. Turbine LED includes a hand-held remote with six speeds, reverse and up/downlight controls with dimming capability. Integrated LED fixtures that meet the high efficacy LED standards set forth in Title 24 and are listed in the California Energy Commission Appliance database.